Now I have found out why Mesh2Flash couldn't show the OBJ from Meshlab, and I have implemented a workaround. It was related to our "trick" of using texture without MTL file. If you find more OBJs that Mesh2Flash can't read, please let me know. Yes, I am using a green and a red filter because these plastic foils were just lying around. And it works well. Also your rotating leaf as a 3-D film is perfect to see. I would like to know if all viewers have the impression, when the red filter is over the left eye, that the object seems to come out of the screen. And vice versa. That would be strange! And that would mean that our eyes and brain are programmed. Im kinda just guessing at my virtual camera placement but they should emulate the eyes. I make a 4 pane window in my 3d program and make the top two windows a crosseyed stereo pair of the object. Since I have taught myself to freeview http://www.angelfire.com/ca/erker/freeview.html I can do a live preview of what the 3d is going to look like at the end. EDIT: I wrongly said I made these red/blue anaglyphs but infact they are red/cyan so I fixed the text. This message is particularly intended for Sven and Mattia. Pierre, I'm glad to be helpful. Thanks for your words. you can quickly cut many Kb just editing the image and the .mtl file. Save the .obj with David and check that the "Save texture coordinates" is active. After you have an .obj file, a .mtl file and your .png file. Open your favourite photo editing software (I've used Microsoft Paint) and load your .png file. Save it as .jpg, with same name (don't change the file name). Open the .mtl file as a text file (I've used Microsoft NotePad) and find the name of the texture file. Delete the ".png" text and replace with ".jpg" text. Save and close. Now you can test if all is ok just deleting your .png texture and opening the obj into david ShapeFusion. You will see the mesh with the texture. At the end you can upload the mesh and its texture into the web page, as you already well know. 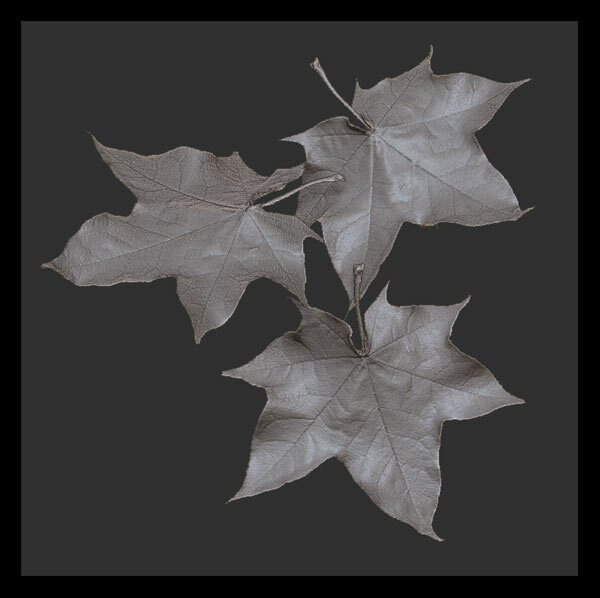 I've tried this trick with my meshes and with Pierre's leaf. For this leaf image I'm starded with a .png of 826 Kb and created a .jpg of 120 Kb. These solutions are aimed to a goal: keep the 3D contents in real time fast to load and fast to play (to browse in 3D view). * To preserve a good quality of 3D browsing: I've tested that on my pc (please see the signature of my messages) the max number of polygons of the mesh mustn't be over 10k. Just with 15k polys, the mesh (I mean only the obj without any texture) isn't any more fast and easy to navigate (the 3D browsing have a lack of frame rate). here is my entry for the challenge . Very nice, what is your material ? Santo : RS_GrayClay for Zbrush, really nice to sculpt with. sheet. A great cheer, but I will also like to see fusions 3D. present their œuvres to us. Hi October is coming again.. be prepared for rain of leaves here..